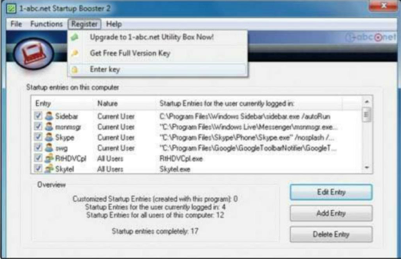 Prevent unwanted software from automatically running by installing Startup Booster. When Windows starts, it opens certain programs automatically. This includes some applications needed by the system itself, but also software such as your antivirus, instant messenger, mouse and webcam, drivers, toolbars and so on. Often when you install such programs, they should start when your computer does. In the case of antivirus software, for example, this is necessary, but for many applications it isn’t. The result? Slower start-up times. That’s where Startup Booster comes in enabling you to control what starts when your computer does. You can easily change or remove entries and importantly, go back if you do something by mistake, so it’s completely hassel-free. 1. 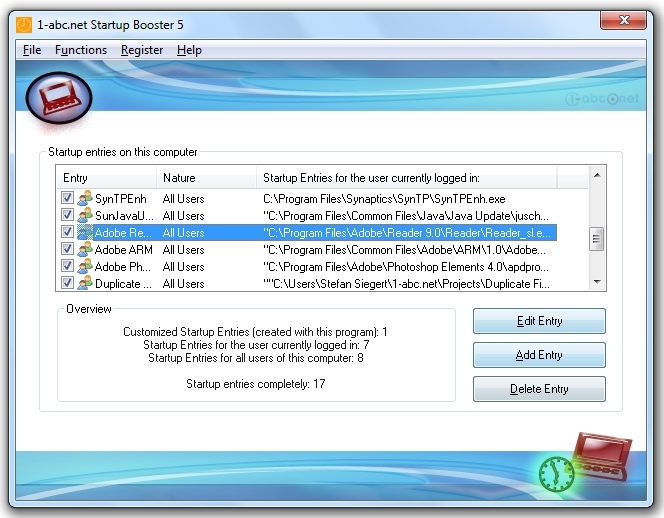 Install Startup Booster : When you first install Startup Booster, you see this screen right at the end of the installation process. Make sure that both boxes are ticked and your computer will take you online to register. Simply enter your name and email address when prompted and you’ll be emailed a product key. 2. 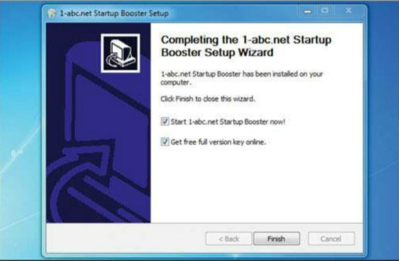 Enter the Key : When you’ve received the key via email, start the application and you’ll see the main window of Startup Booster. Go to the Register menu and select ‘Enter Key’. This authenticated the applications and gives you the full version of the software rather than the less powerful demo. 3. 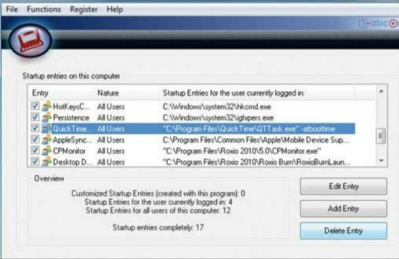 Delete an entry : Startup Booster gives you a list of everything that starts up when your computer does. Don’t know what something is? The easiest way to find out is to search for it online. Once we’d looked down through the list of start-up item, we decided to remoce QuickTime. Select it, then click ‘Delete Entry’. 4. Gone but not forgotten : Now you can see that QuickTime is gone from our list, and we can remove or edit as many entries as we like ( though make sure you know what something is before deleting it. ) Made a mistake? See Reverse Changes above. If you’re happy, well done – you’ve speeded up your Windows start-up process.